Fresh ingredients, unpretentious and delicious comfort food are at the forefront of The Chop House experience, along with a vibrant atmosphere for groups of good friends to socialize and relax over a great meal. Hearty items on the menu are accompanied by an extensive selection of wines, crafted cocktails, artisan beers and a collection of inventive milkshakes. 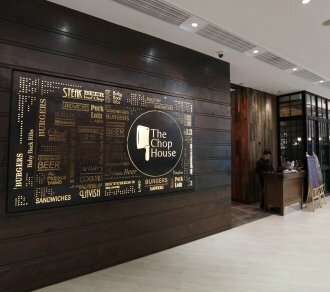 The Chop House enjoys a fabulous and rare feature in the form of a massive Al-fresco dining atrium as well as a cozy interior seating for those who prefer an indoor, homespun dining ambiance.